There are many lists of apps available including those for special needs and ASD. While looking on the Ohio Center for Autism and Low Incidence (OCALI) for resources and references for a recent evaluation, I found their January 2012 PDF listing on “A Spectrum of Apps for Students on the Autism Spectrum“. A quick review of the many topic areas and apps on the list found many familiar but many new apps worth exploring. The Social Challenges category had a number of unfamiliar and intriguing apps such as the Urinal Game app ! The OCALI Autism Spectrum list categorizes apps by topic areas and provides many other links and resources for finding apps for students with disabilities. An OCALI app is now available (free) for iPad, iPhone and iPod Touch featuring podcasts and videos of webinars and presentations hosted by OCALI in a wide variety of areas that relate to students with disabilities. This is great way to listen to professional topics on the go on you iPhone. I have found OCALI’s ASD resources outstanding and trust that their list and apps is compiled with wonderful, recommended apps and resources! If you work with students with ASD or low incidence students OCALI resources are worth checking out as a resource for parents as well as professional resources. They have a wonderful handout available for transition to adulthood guidelines if you work with secondary students and beyond available on their website (along with much more!). Resources for your OT professional development! This entry was posted in App Reviews, Apps for Special Needs, Autism, iPad, iPhone, iPod, Sensory Apps for ASD, Social Skills, Special education and tagged App Review, App Review sites, iPad, iPhone, iPod, occupational therapy, special needs students. Bookmark the permalink. Nice post. I learn something totally new and challenging on sites I stumbleupon every day. It’s always interesting to read through articles from other writers and use a little something from other sites. Dallas Flower, If you are looking for apps for ASD also check out the Autism App, free for iPhone and iPad. The apps are categorized with 100’s of apps reviewed. It is one of my go to’s! 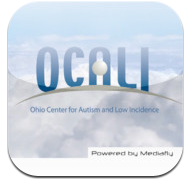 OCALI’s – app list is a fabulous resource for ASD and transition – also check out their resources – it is awesome.